An Evening with the Nimham Mountain Singers, a Unity Drum. 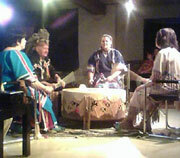 An interactive program of drumming, singing and dancing. Traditional northern woodland songs, mostly of Algonquin speakers.